Place the nuts in a food processor and blend until roughly chopped. Add the oats, chia seeds, cinnamon, coconut flakes, pumpkin seeds and salt and stir until well combined. Melt the coconut oil and combine in a small bowl with the vanilla and maple syrup. Pour over the dry mixture and stir until the granola is evenly coated. Spread the granola evenly onto a baking paper lined tray. Bake at 180 degrees for approximately 30-40 minutes. Check the the granola every 10 minutes and give it a gentle stir to ensure the granola is evenly browned. Serve with milk or yoghurt of your choice and fresh berries. Swap the nuts to suit your preference (pistachios work really well). Add some chopped dried fruit for added sweetness (think Goji berries, dried apricot and apple). 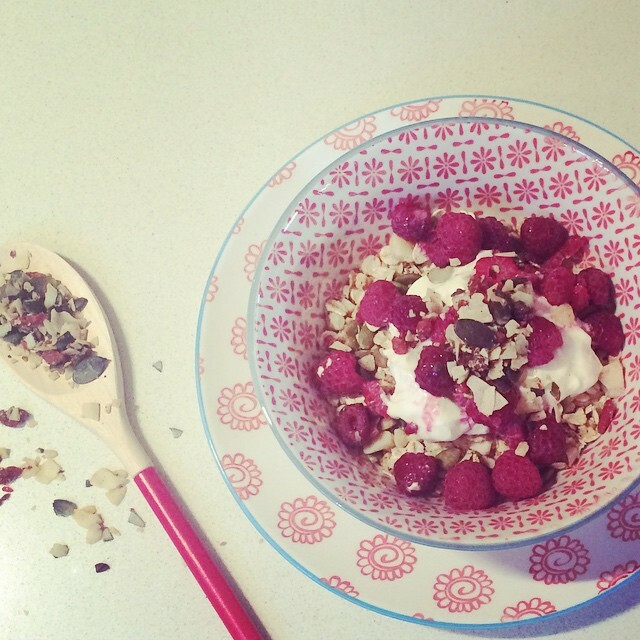 Swap the rolled oats for quinoa flakes for a gluten-free friendly granola. Swap the maple syrup with another tablespoon of coconut oil if you prefer a less sweet granola.